Preheat oven to 350 F. Lightly grease and flour 2 (9-inch) baking pans. Cream butter and mix in bananas and mix well. Alternately add dry ingredients into creamed banana mixture alternately with buttermilk. Bake in pre-heated oven at 350 for 30 to 40 minutes or until a toothpick inserted in center comes out clean. Do not over-bake cake. Remove from oven and cool in pans for 10-15 minutes. Remove from pans and let cool on wire rack. Once completely cool, frost as desired. I used an icing that’s not too sweet, but just sweet enough to allow the banana cake to shine. 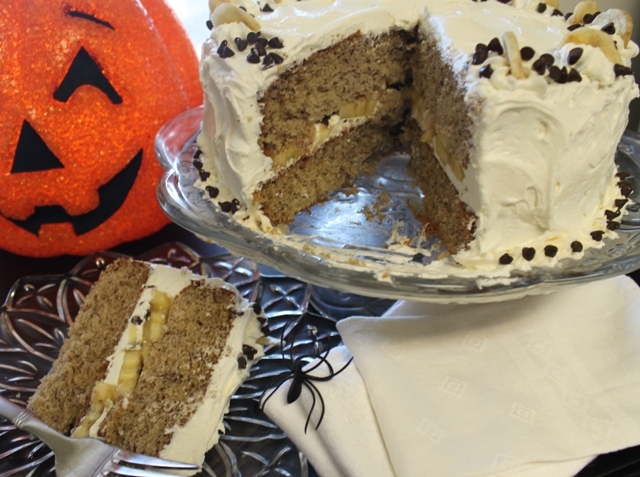 * I used dried banana chips to decorate the top, but inside between the layer are real slice bananas. ** I squeeze a little fresh lemon juice on the bananas first before adding them to the cake (between the layers). *** I also sprinkled mini chocolate chips on the first layer before I put the banana slices on it. I decorated the edges with mini chocolate chips and around the bottom of cake.